I've spent a lot of time recently on student council duties. But, I finally got the basketball homecoming t-shirts ordered today. I got a bullying assembly scheduled, and I found out that we will have the funds to bring Victims' Impact Panel in to present to our students before prom. Algebra 2 started polynomial long division today. I found it really helpful to have my students work through several regular long division problems, first. I was surprised when some of my students told me that they didn't know what long division was. But, they seemed to all remember the process with a little review. At first, my students told me that polynomial long division was too confusing. I heard multiple students say that they would just always divide polynomials by factoring and cancelling. (Of course, these were the same students who told me that they hated factoring and couldn't remember how to factor yesterday.) I tried convincing them that they wouldn't always be able to factor and cancel, but I'm pretty sure my reminders fell on deaf ears. By the end of the class period, my students were actually starting to become comfortable with the process. Tomorrow, we'll do a lot more practice and look at some word problems that can be solved by polynomial long division. Something really cool happened, though, in my Math Analysis class that pretty much made my day. One of my Algebra 2 students is also in my Math Analysis class this semester. These students had also been struggling with remembering how to factor. So, today we worked through the Polynomial Puzzler problems from NCTM Illuminations. 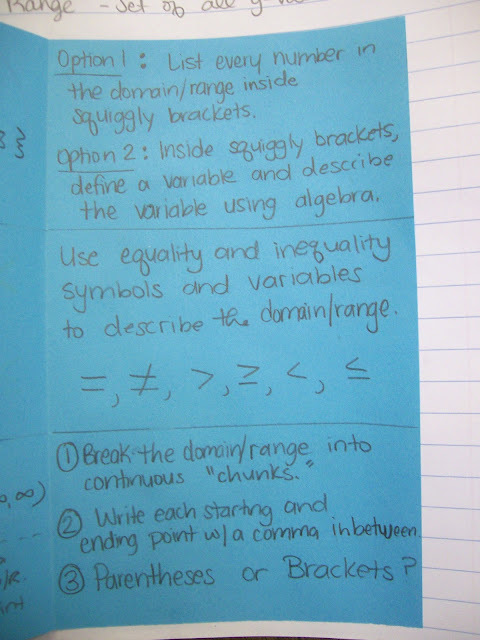 It changed things up a little bit, and it gave my students more practice before we continue our work with quadratics. My Algebra 2 student was having trouble figuring out how one of the quadratics factored, so she asked me if she could do the "division thing" from this morning. 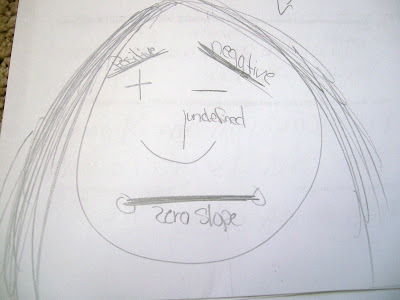 Incredibly surprised and delighted, I told her that she could use polynomial long division to find the missing factor. It was a proud teacher moment. Later, when she turned in her assignment, she told me that polynomial long division made solving the puzzles much easier. I did have to confiscate something from one of my students this afternoon which was disappointing. Then, another student stole the confiscated item from my desk. I caught it, but I was even more unhappy. My students told me it was the first time that they had seen me mad. Apparently, I look evil when I get mad. Usually, I would focus on this one bad thing when reflecting on my day. But, today I'm choosing to focus on the good. Student Council is going well. And, whether it feels like it or not, I am making a difference with my Algebra 2 students. 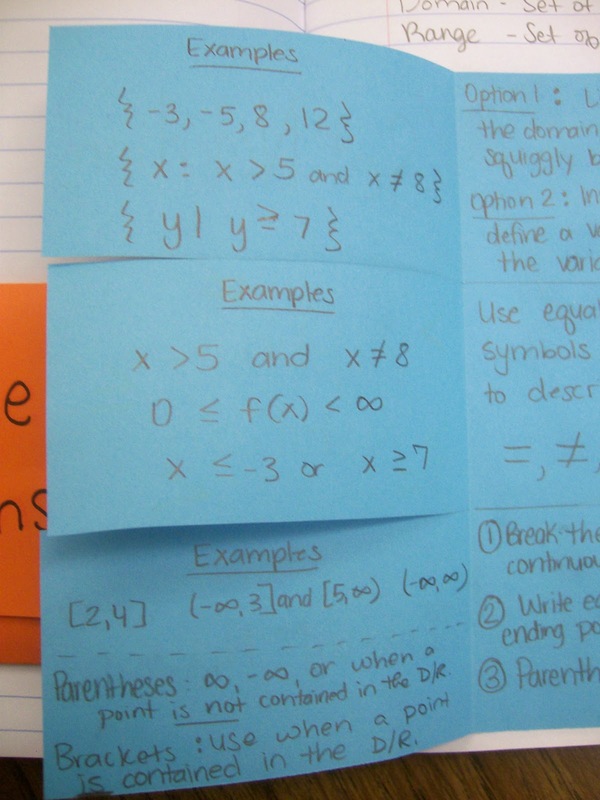 One of our objectives in Algebra 1 is that students will be able to add and subtract polynomials. My students are usually pretty good about remembering to distribute the negative when the second polynomial is written in parentheses with a subtraction sign in front. The state of Oklahoma doesn't always write the questions in this format, though. A favorite format of theirs is to give two polynomials and ask for the sum or difference. If the problem asks for a difference, students must realize on their own that they need to change the signs of the terms of the second polynomial before combining like terms. 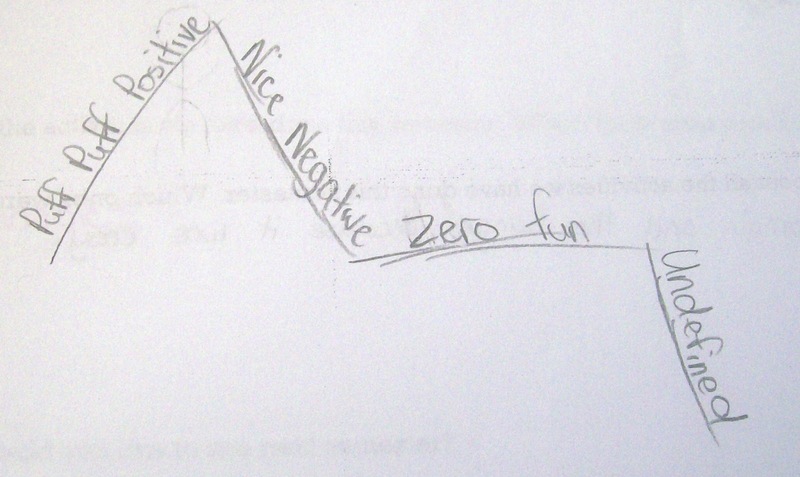 I reviewed distributing a negative through a set of parentheses with my students as bellwork. Then, I gave each pair of students a deck of cards I had created and a penny to simulate this specific question type. I printed all of the x squared terms on one color of paper, all of the x terms on another color, and all of the constants on a third color of paper. Then, I laminated them and cut out the pieces. Each pair got a bag of pieces and a penny. The students' first job was to sort the cards, face-down, into three piles by color. 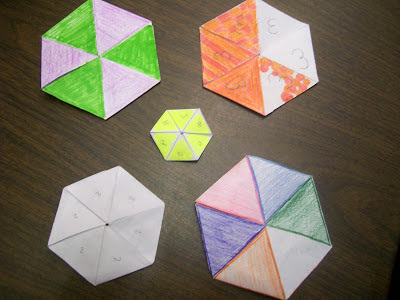 To begin, they would turn over one card of each color to form the first polynomial. Then, they would turn over another set of cards to form the second polynomial. 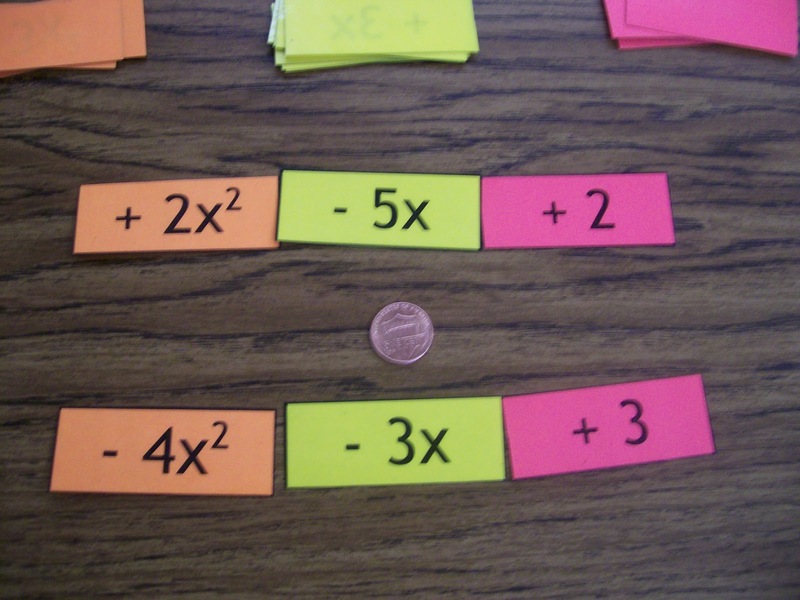 Finally, students would flip the penny to determine if they were finding the sum or difference of the two polynomials. Heads meant sum. Tails meant difference. After creating their problem, both students would solve the problem independently on their whiteboard. When both students were finished, they were supposed to compare their answers. If the answers agreed, students would use the cards to create a new problem. If there was a disagreement, I would come over to help the students. * Students got lots of practice. No worksheet involved. We did the first day back from Christmas break, so I wanted an activity that would help them transition from break mode to school mode. * The pace of the activity was instantly differentiated. My advanced students worked through a good number of problems. My special education students were able to work at their own pace without having to worry about how many they had finished. Instead, they could really focus on understanding the process. * The randomness of what cards were dealt and the result of the coin flip led to some great conversations with students. For example, I would probably never ask students to find the sum of two polynomials that summed to zero. It happened to a group of my students, though. As a result, we got to discuss what happened when all of the terms cancelled out. * A few of my upper-level students soon grew bored of the activity. * Some of my groups seemed to have all of the luck and flipped heads each time. I'm pretty sure a few of these groups had more than luck on their side. * And, the activity was not self-checking. I did not come up with the idea behind this activity myself. Actually, I combined aspects of several other activities to create my own. Pam Wilson did a version of this activity using wooden blocks and a penny. I didn't have any wooden blocks, and I was planning this at the last moment. So, I replaced the blocks with cards similar to this activity from Joy in 6th. Cards can be downloaded here! This week, my math classes are celebrating Universal Letter Writing Week. Universal Letter Writing Week takes place during the second week of January. I had originally wanted to make this a student council project. My student council officers, though, were less than thrilled with the idea of setting up a letter-writing station in the cafeteria during lunch. I still wanted to do it, though, so I'm kinda forcing my own students to participate. They've been begging me to do origami ever since they returned from Christmas Break to find new decorations hanging from the ceiling. My sister actually made these origami cubes and colliding cubes and whatever you call the one in the picture above in math class in junior high. Over Christmas Break, she was cleaning her bedroom and found them. We decided they would be the perfect thing to hang in my classroom. Now, all of my students want to make them. The only problem is, I don't know how. And, I still have many more units to teach this semester. I think this may be a perfect project for my students after they take the EOI in April. 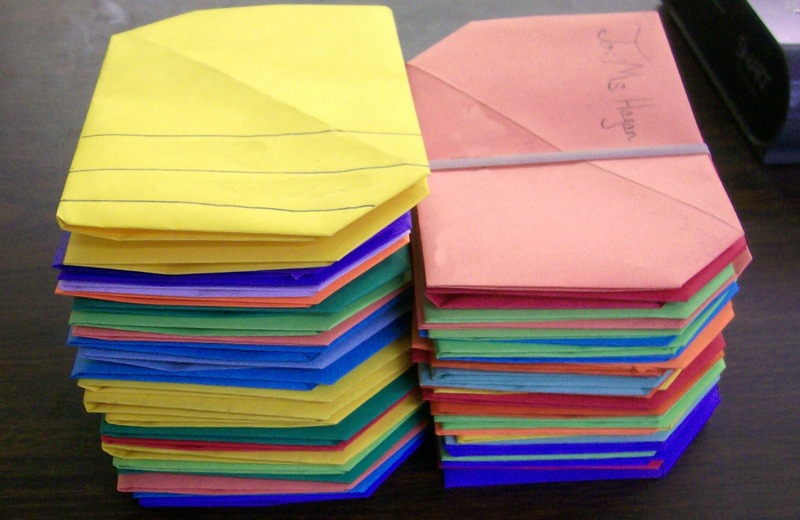 So, with origami on the brain, and Universal Letter Writing Week in mind, I decided to have my students write letters on colored sheets of paper. On Tuesday, I had them choose a teacher to write to. Today, I had them choose a school employee who was not a teacher. This profession is often a thankless one. 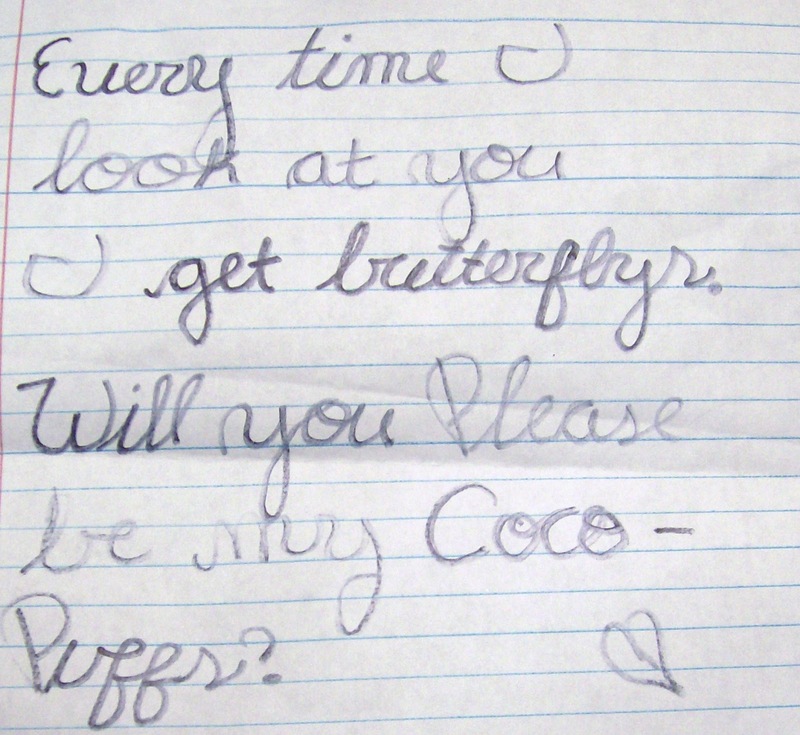 I know how much it means to me when I receive kind words or a compliment from a student. Knowing that one's work is noticed and appreciated is energizing. I truly treasure the letters that students have written me. After writing our letters, we folded them into a basic origami envelope. This is Tuesday's batch of letters from my students to various teachers. Aren't they just so beautiful? Aren't they just so bright and cheery looking? I can't help but smile when I see this picture. 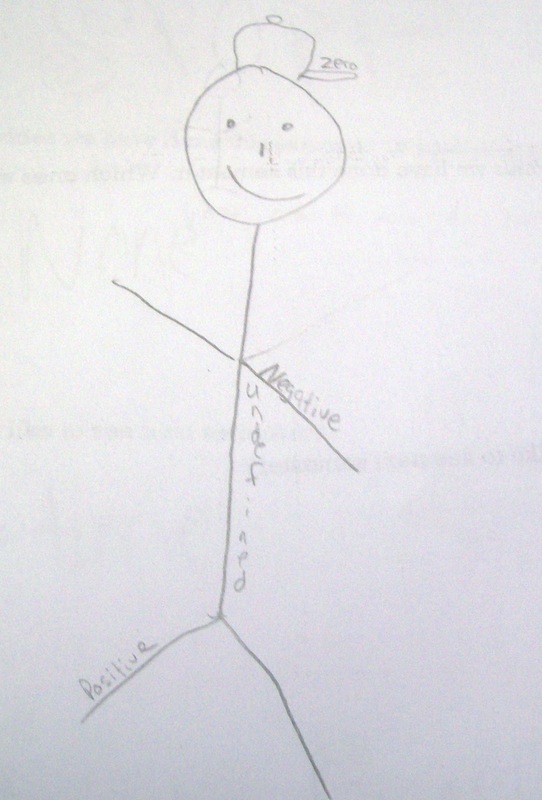 Some of my students were disappointed that they didn't turn out looking like a typical envelope. But, I just loved seeing the stacks of colorful, uniform letters that were just waiting to be opened and read. I loved delivering them and seeing the surprise on the faces of the recipients. I'll be honest. This did eat up much more class time than I expected. We have 50 minute periods, and the first letter we wrote took about 15 minutes of class time to write and fold. On the second day, the students were already familiar with the process, but, it still took 10 minutes of class. Losing class time did make me uneasy. My students are years behind in mathematics, and time is a precious commodity. When I look at all of the standards that I have yet to even introduce, I start to enter panic mode. Believe me, that is not a good place. Worrying doesn't do my students or me any good. Looking back, I am proud of this project. I am proud of the fact that I did something that benefited both my students and my coworkers. My students got the opportunity to say thank you to someone who has made a difference in their lives. Those I work with got to read those two words that they do not hear often enough. A mentor of mine encouraged me to look for opportunities to be a catalyst of change in my school district. This project was a step in that direction. A step towards making the school I work for a better place for teachers and students. I'll never know the magnitude of the impact that these letters will have on their recipients or their senders. But, I can hope that they encourage my coworkers to give these students their all every single day. Because whether we hear the words "thank you" or not, we are making a difference. The time I have with my students is too precious to waste. It is time to support them, inspire them, encourage them, prepare them for the future, remind them that they are cared for, and teach them some math, too. Tomorrow, my Algebra 2 class will begin identifying the domain and range of a function from a graph. 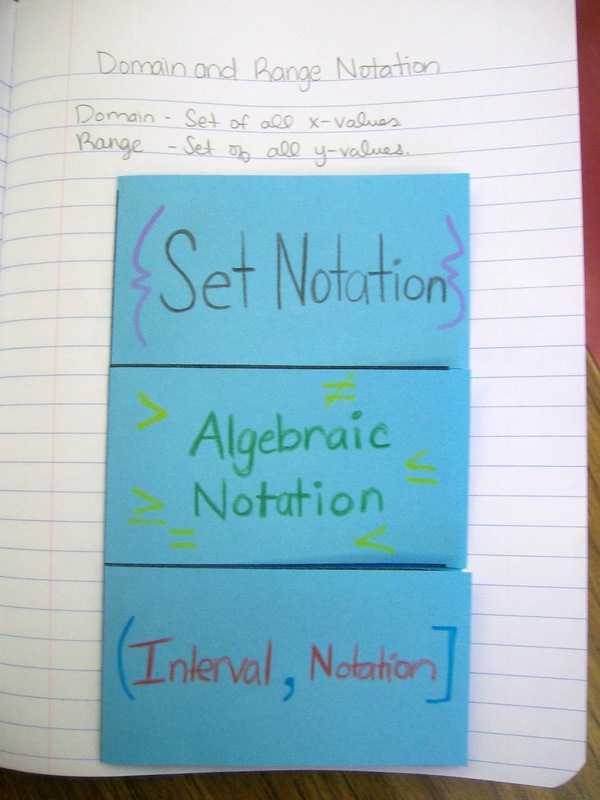 I created a foldable to help my students keep the three different notations separate. 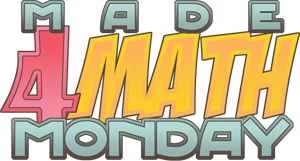 I don't know how well it will work out yet, but I wanted to get it posted for Made 4 Math Monday. I used a basic three door foldable. The first flap contains all of the information about set notation. 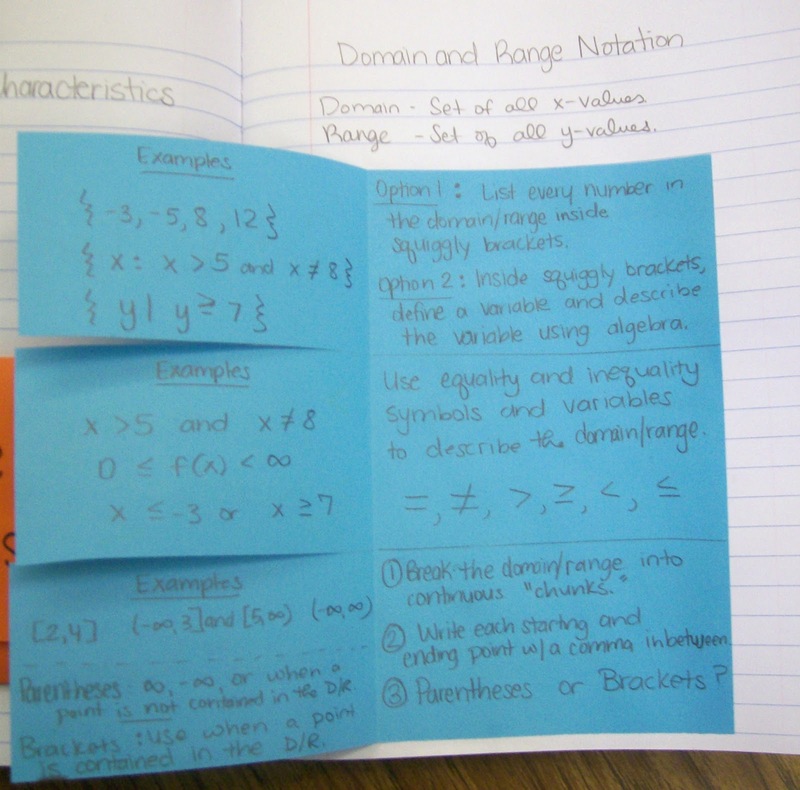 The second flap features algebraic notation, and the third flap focuses on interval notation. I've uploaded my template that is sized to fit in a composition notebook below. My students will add this to our interactive notebooks. This is one of my favorite and most versatile foldables. Before, I've used it to capture information on Parallel and Perpendicular Lines, Different Ways of Finding Slope, and Types of Correlation. If I taught my Algebra 1 students anything this semester, I taught them slope! I had my students fill out an evaluation form before Christmas Break. On the back, I gave them a chance to just be creative. 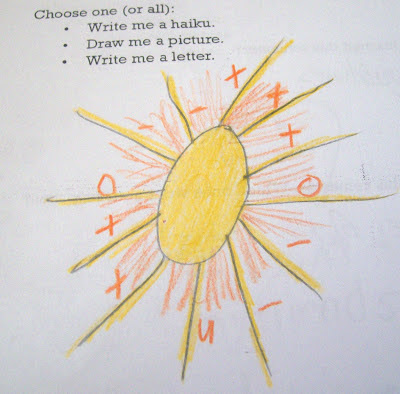 They could either write me a letter, draw me a picture, or write me a haiku. 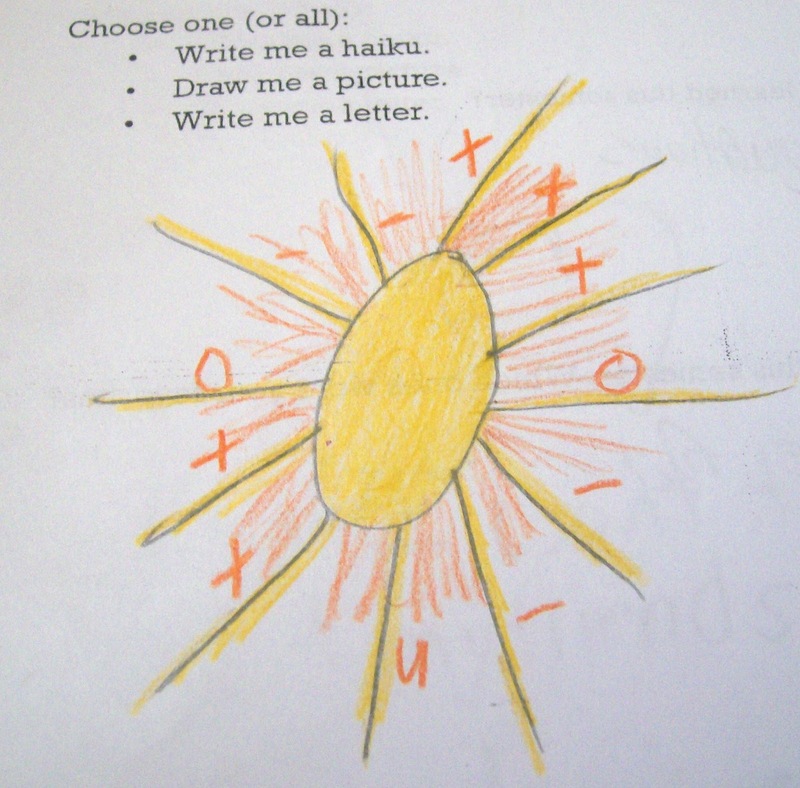 Surprisingly, haikus were a foreign concept to my students. 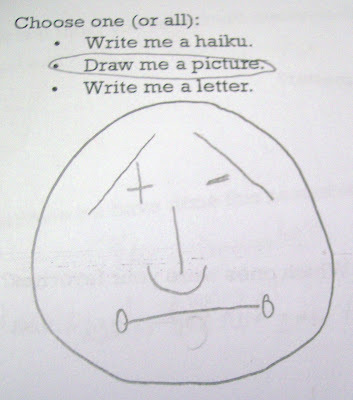 I think I only had two students write me a haiku. 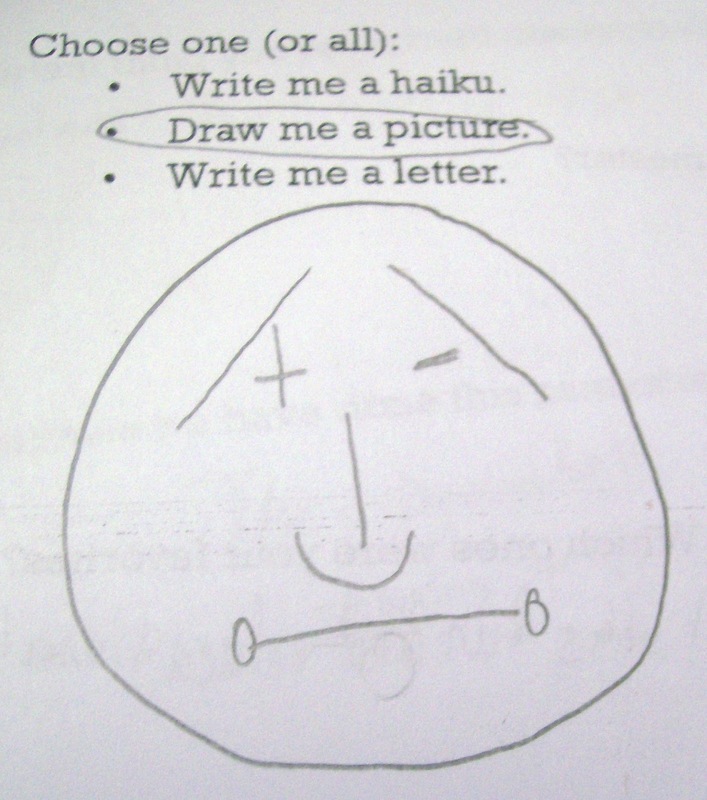 I'm thinking that I'll have my students write a haiku about one of our vocabulary words soon. 2012 has been a most eventful year for me. 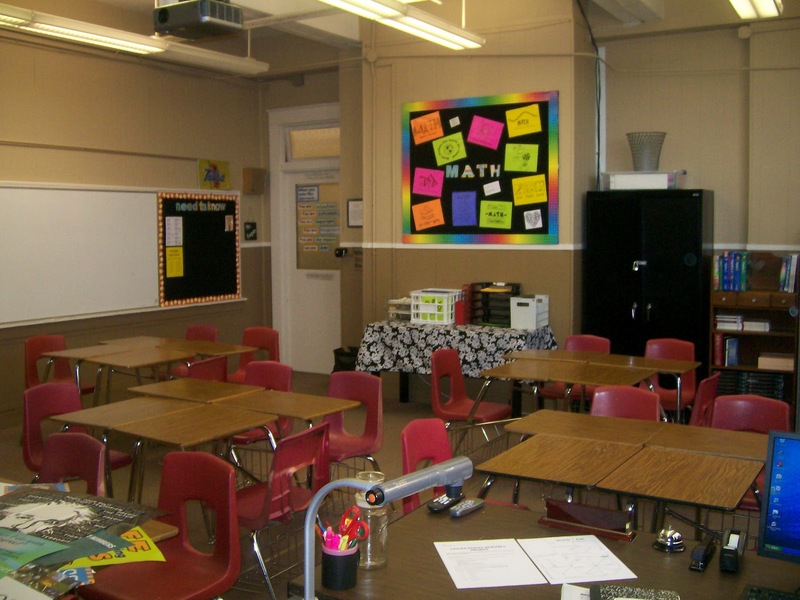 In January, I started my student teaching at a urban high school in Tulsa, Oklahoma. Having been raised in a rural/suburban area, my first few days of student teaching left me in shock. The class sizes were large. I was appalled at the language used by the students. My eyes were opened to what poverty looks like. I asked lots of questions. I stepped out of my comfort zone and taught algebra in Spanish. And, I made my first foldable. It was a life-changing experience. In February, I experienced my first snow day as a teacher. I became incredibly attached to the students I was working with. 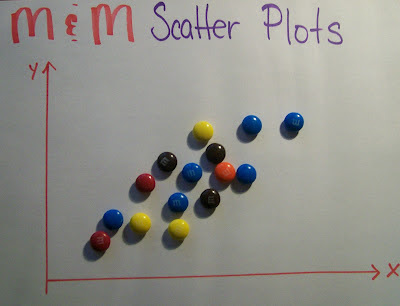 I taught my students about scatter plots and correlation using M&M's. I left my first student teaching experience without saying goodbye to my students. That is something I will probably always regret. At the very end of February, I switched from an urban high school to an urban middle school. The differences between the two were astounding. During my second student teaching placement, I was given more freedom and responsibility than I could ever have imagined. I was TERRIFIED. I had 5 classes of 8th grade math students. The 8th grade math test was fast approaching, and how these students did on this math test would determine how they spent their next four years of high school. After two weeks of observing, my cooperating teacher handed over the reins to me and took a seat in the back of the classroom. I'll be honest. It was tough. When a lesson wasn't going well, when the students wouldn't quit talking, when there were ten extra minutes at the end of the class period, it was entirely up to me to figure out what to do. And, I didn't always make the right decision. I almost always learned my lesson, though. Lessons learned by experience will stick with you way more than advice from your professor or a book on teaching. I spent my Spring Break filling out job applications to almost every single school district within a one-hour radius. In April, I had two job interviews. The first interview was for a middle school math position. My second job interview for a high school math position was a whirlwind of an experience that ended with me being offered a job on the spot. After thinking it over for a day, I accepted the position. I'm not quite sure I knew what I was getting myself into. From my interview experience and from looking at the school's test scores, I felt like the school needed me. And, that was enough to make me leave behind everything familiar and move to a town where I didn't know a single person, a town that I had never been to before the day of my job interview, a town without a stoplight. I finished my student teaching at the middle school level. 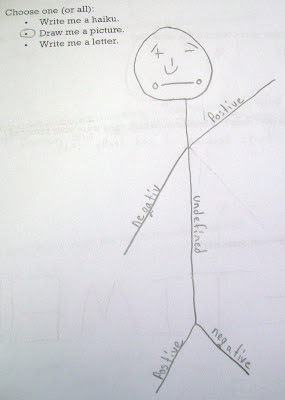 I'm not even sure if it is possible to convey all that I learned from my middle school student teaching experience. 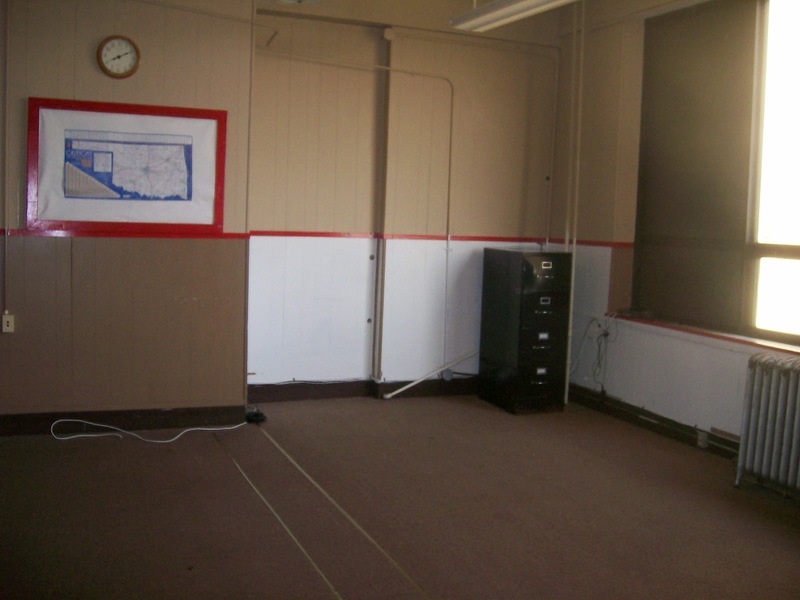 It was in that classroom that I started learning to put aside the educational theories I had been taught and focus on the students that I was standing in front of. The students became my focus. It didn't matter how long I had worked on creating a worksheet. If that worksheet was doing a disservice to my students, I had to throw it out and create something new on the spot. It didn't matter how much I disliked making decisions. My students needed structure. They needed a decision maker. They needed me to create a productive learning environment. My 8th graders rocked their state math test. And, this time I said a proper goodbye to the students that I had, again, grown so attached to. 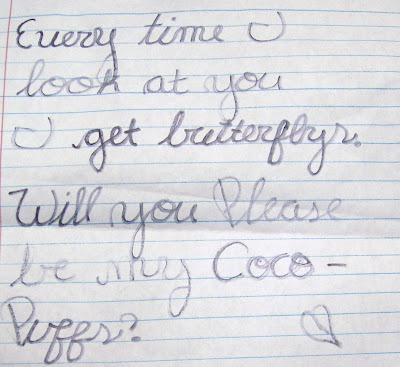 My cooperating teacher had the students write me letters that I will always cherish. In May, I donned my cap and gown and walked across the stage at graduation. I moved out of my on-campus apartment, and moved back in with my parents for the summer. I went to my first school board meeting where my hiring was officially approved. I worked in the office of my family's business. I also got to see my classroom for the first time. When the school counselor told me it needed a little TLC, she wasn't joking. In June, I found me a house to rent in my new town. My mother, sister, and I started brainstorming ways to fix up my classroom. And, of course, I worked for my family's business. The majority of July was spent moving into the house I had rented, fixing up the house I had rented, and fixing up my classroom. My parents and sister were amazing. I definitely couldn't have done it without them. I sent out a tweet that would change my life. And, I ended up connecting with an amazing group of math teachers from across the United States and even the world. In August, I put the finishing touches on my classroom. 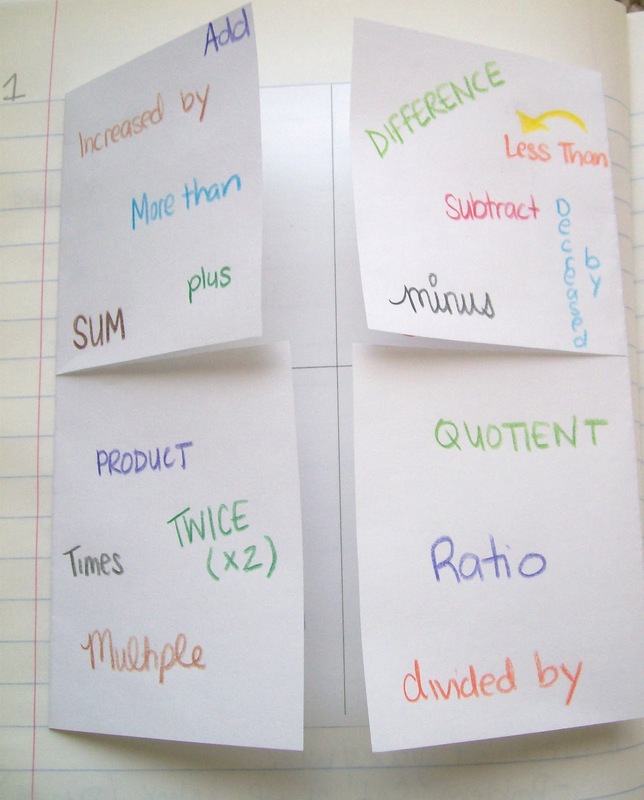 I spent hours scouring twitter, google reader, the web, and pinterest for ideas for my interactive notebooks. My entire town was evacuated due to wildfires. The fires came within three tenths of a mile of my house. It was definitely one of the scariest experiences of my life. Some of my students and coworkers lost everything they owned in the fires. I lesson-planned like I never had before. I began my first year as a teacher. It definitely had its challenges, but I knew that this was the job I loved and was meant to do. In September, I was asked to prepare a presentation for our next staff development session on hands-on teaching. I was honored, but shocked that they had chosen a first-year teacher to present to the entire high school faculty. Students had been talking about my teaching strategies, and the talk was good. October brought with it my first experience with parent teacher conferences as a teacher. I experienced my first Fall Break in what seemed like forever. I truly loved my college experience, but I really missed having a few days off in October to rest, relax, and to get caught up on everything. (They did give us a full week off for Thanksgiving to compensate, but it just wasn't the same.) Of course, I ended up catching a cold that spanned my entire Fall Break. My teacher self, though, would rather be sick on break than teach while I feel miserable. 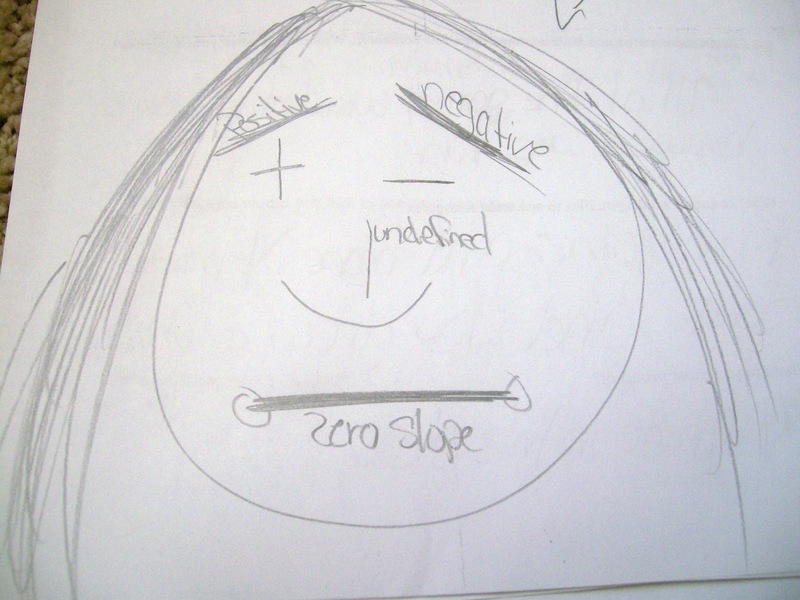 In November, my students started working with slope and graphing linear equations. 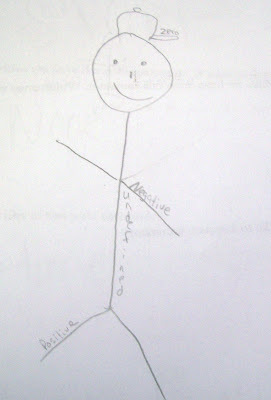 I'm pretty sure that this is my favorite unit to teach. Slope Dude was a bigger hit than I could have ever imagined. 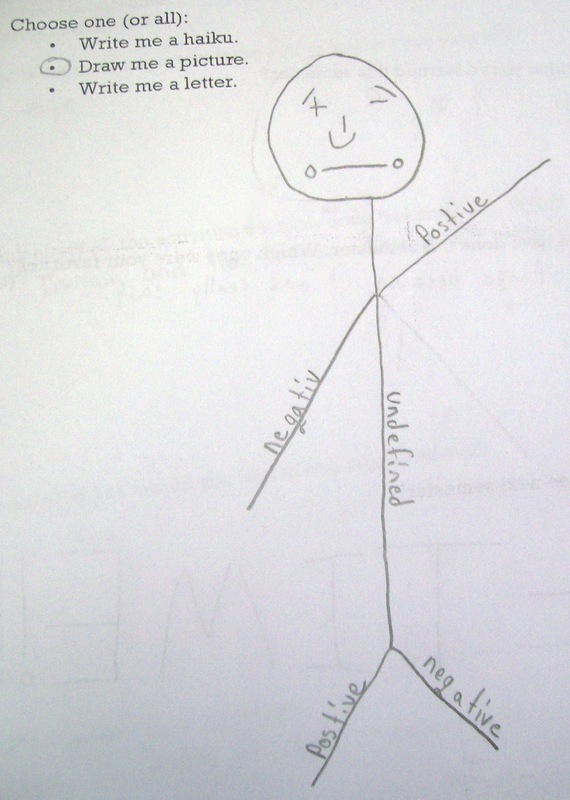 Seriously, if you teach slope and haven't introduced your students to Slope Dude, you and your students are missing out. 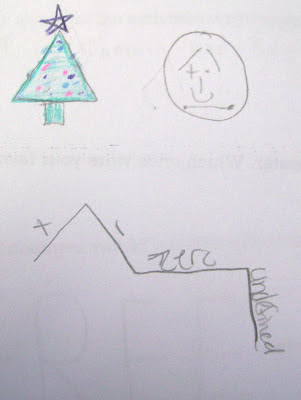 Mrs. H even stopped by my blog and left a comment about how Slope Dude got started. It will always be "Puff Puff Positive" to my students. Some of my students even took it on themselves to show the youtube video to some students who have the other Algebra 1 teacher. I survived my first Student Council State Convention. It was definitely an experience! Having last been a part of student council in the fourth grade, I have a lot to learn. My students, convinced that the science teacher and I should be dating, started writing us both fake love letters from the other. They were actually quite amusing, especially since everyone knew exactly who was writing them. Several of my students retook their Algebra 1 EOI in December. In Oklahoma, students have to pass their Algebra 1 EOI or an equivalent test in order to graduate. These students have been taking both Algebra 1 and Geometry this year. I'm excited to report that all of my Algebra 1 students who retook the test passed! And, quite a few of them scored advanced! I'm so proud of them and all of the hard work they put in. It was a great experience as a teacher to see the light bulbs finally go off. I gave my first semester tests. 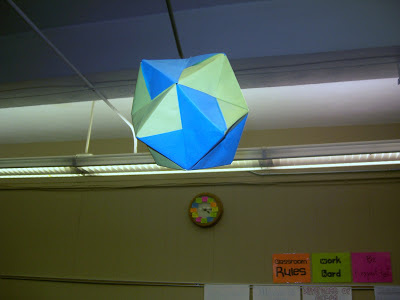 And, we spent the last few days of the semester making hexaflexagons. I've spent my Christmas Break with family. I helped complete inventory at my family's business. I've been brainstorming lots of ideas for new foldables and activities for next semester. I'm reading Making Thinking Visible, and I'm trying to figure out how to take these ideas and strategies and put them into place in my own classroom. This book has shown me that I have been doing my students a disservice by not giving them opportunities to think. Thinking is something that only happens when planned for.